LADIES' NIGHT IS going to roll on a little longer as we continue to add more items to our Spider Verse line! Check out this new item! Accident: Jessica still sometimes lacks control over her powers when she gets emotional and still doesn't like to fly as she has trouble with landing. Enemy: Norman Osborn, The Purple Man. Guilt: She still has guilt about her time spent under The Purple Man's control. Relationships: Her husband Luke Cage and she is fiercely protective of their daughter, Danielle Cage. She is also close friends with Carol Danvers (Ms. Marvel), Jessica Drew (Spider Woman) and Barbara Gordon (Oraclel). A) I've had her done for a while I wanted to post her. B) She went to Midtown High with Peter Parker, so there. Jessica Jones has had an interesting career in Marvel comics. From clumsy superheroine, to mind controlled minion of The Purple Man (what a lame name, WHY did they just not go with his real name of Zebediah Killgrave which is far more menacing as Jab has noted) to ace reporter to the woman who tamed Luke Cage and had his baby. But she was still pretty D List. Now she has a hit Netflix series and has become THE investigator in the Marvel U. Another example of a character having the right creative team behind them at the right time and becoming a star out of nowhere. Secret Origins: Midtown High student Jessica Campbell went to school with Peter Parker, on whom she had a crush on and was present when he was bitten by the irradiated spider that gave him radioactive powers. Jessica's father received tickets for Disney World from his boss Tony Stark. On the way home, their car collided with a military convoy carrying radioactive chemicals. Her family is killed, and she spends several months in a coma. Upon waking, she is placed in an orphanage and adopted by the Jones family. Jessica later discovers that her radiation exposure granted her super strength, limited invulnerability, and flight. Jessica's adoptive parents re-enrolled her at Midtown High, where she is ostracized by her classmates, especially Flash Thompson. Peter Parker (who has since become Spider-Man) senses in Jessica a kindred spirit—someone who has also lost her family due to a tragic circumstance. Jessica mistakes his kind attention for pity and lashed out at him. She later witnesses a fight between Spider-Man and the villain Sandman in her school. This inspired her to use her abilities for positive ends. The Story so Far: She attempted to become a super heroine, calling herself "Jewel", and was active for a couple of years. Little is known of her exploits during her tenure as Jewel, as mainstream media didn't monitor her as closely as other heroes of the era. One day, she happened upon a fistfight in a restaurant, and discovered that Zebediah Killgrave aka the Purple Man had told the men to fight. Killgrave then overpowered Jessica's will and told her to "take care of the police" so that he could finish his meal, which she did. Jessica was captured by the Purple Man and kept prisoner for eight months, though she was never used for sexual means. However, she was used by Purple Man as an accomplice in his schemes, and hurt people. She was eventually sent to attack the red-costumed Daredevil at wherever the "...costume frat boys hang out..." and kill anyone who got in the way, after a newspaper report angered Killgrave. Jessica became disoriented once she was out of range of the pheromones produced by Killgrave but, having been under his control for so long, she was still focused on her mission. She ended up attacking the Scarlet Witch because her costume was red, like Daredevil's. Still bitter about her experience, Jessica briefly became a hardened vigilante, calling herself Knightress. However, her stint as Knightress only lasted for about a week. Intercepting a crime meeting between the Owl and a mafioso, she first encountered Luke Cage. After defeating the Owl and his goons, she discovered that one of the thugs had brought his children with him. She took off her mask and revealed her identity to the cops so that they would allow her to look after the children for the night. Luke went to her home later that night and the two had a long talk. Jessica retired as a super heroine and began a new career as a detective, creating Alias Investigations. Her first case was Luke Cage hiring her to find his father James Lucas. After many cases she began to develop a reputation as a top notch investigator. During this time period, she and Luke had a few intimate meetings and each seemed to have feeling for each other but never truly committed to each other. After another encounter with the Purple Man while she was seeing Scott Lang Jessica admitted to Scott that she was three months pregnant, and that the baby was not his, at which point Scott walked away. A few days later, Jessica met Luke outside his apartment. He admitted that he cared about her, and she told him that she was pregnant and that the baby was his. Luke asked if she wanted to keep the baby, and when she told him that she did, he suggested that the two of them could start a "new chapter." Jessica moved in with Luke in Harlem and Jessica soon met with Editor-in-Chief Robbie Robertson at The Daily Bugle. He took her to meet J. Jonah Jameson, who blamed the decline of the newspaper industry before admitting that his relationship with Jessica has caused him to reconsider some of his belief regarding "costumed vigilantes." Jameson acknowledged that his personal disdain for superheroes is hurting his newspaper, and offered her a job as "a vigilante analyst" for "a special weekly section of the paper. Tentatively called The Pulse, the stories for the section were to be written by Ben Urich, with Jessica working in a research and consultant capacity. Jessica insisted on health insurance and a stable contract before admitting that she was pregnant with Luke's child. Jameson requested that part of their deal would be give the Bugle exclusive coverage of the announcement and birth. Jameson admitted that Ben's best reporting days may be behind him, but The Pulse is about her. Luke was not happy about her new job. Kat Farrell met with Jessica and Ben in Central Park to bring them up to speed on the details of Kidder's death, and the three of them consider how many "flying people" live in New York City. Kat laments that S.H.I.E.L.D. will have to be called if "a flying guy" was involved. Ben met with Jessica, Kat, Jameson and Robertson and explains that Oscorp employees have been disappearing, and he could prove that Norman Osborn was the Green Goblin. Despite his fears that running such a story "will look like a cheap vendetta" against Osborn, Jameson agreed to print Urich's article. Jameson instructed Jessica to go with Urich to notify the police, assuring her that she will be safe. But at Oscorp they are attacked by the Green Goblin. A blast knocked Jessica out the window but she is rescued by Spider-Man, but she worried she may have lost her baby. Jessica attacked the Goblin and the two brawl in mid-air. Osborn escaped as Spider-Man caught her. Luke met Jessica at the hospital as a doctor examined her, but the baby was fine. Cage then left the hospital, claiming that he "can't let this go." Osborn is then outed and arrested after a savage beat-down by Luke for hurting Jessica. After their involvement in Nick Fury’s Secret War, Luke Cage became a New Avenger. Jessica was also in attendance when Santron attacked the Avengers at their annual Christmas party. Jessica Jones's water broke while she, Luke Cage and best friend Carol Danvers were picking out a new costume design for him. Carol Danvers rushed Jessica to the hospital. Jessica gave birth to a baby girl they named Danielle. Jessica finally decided to marry Luke and they were married with all their friends and family present. Jessica choose to keep her maiden name Jones. Jessica took up the identity of Jewel again and became a member of the New Avengers. She and Luke began searching for a nanny and had a varied selection of applicants including Hellcat, Mantis, D-Man, Firebird, Sersi, Echo, U.S. Archer, Molly Hayes, Ultragirl,Groot, Deadpool, Sepulchre, Cassie Lang, She-Hulk, Nighthawk, Devlor, Tigra and Beverly Switzler. In the end they choose Squirrel Girl as Danielle's nanny. Jessica briefly took the name "Power Woman" to both honor her husband and to be a role model for their daughter. After some time as an Avenger, she helpedthe friend of her adoptive aunt to track down a fireman that had rescued her during the original Human Torch’s initial appearance over 75 years ago. Jessica decided it was time for her to reopen Alias Investigations. After Luke Cage, Daredevil and Iron Fist disrupted the operations of up-and-coming crimelord Diamondback, he retaliated attacking all of them and Jessica, due to his relationship with Cage. Jessica was hospitalized due to the attack, but recovered quickly. During the four heroes' search for Diamondback, Daredevil noticed it could help people know that they actively worked together. They continued operating as a team to investigate Diamondback, and eventually became known as the Defenders. Diamondback was defeated by Iron Fist when Stryker attacked him and Jessica while they were on a stake-out. Stryker was arrested but escaped while being transported. The Defenders tracked him down and defeated him even though he had ingested the power-bestowing drug Diamond, leading to Diamondback's second arrest. After the events of Secret Empire of HYDRA, Jessica and the rest of the Defenders attended Diamondback's trial, from which he walked away due to the secret intervention of his benefactor and the the former Kingping of crime, Wilson Fisk. Jessica enlisted Deadpool's help to find Diamondback, but the Defenders ended up beating him up over his usual attitude. Diamondback was eventually tracked down and defeated for good. Jessica eventually learned that the Purple Man had escaped custody. Jessica tried to hide, but Killgrave reached her by taking control of Danielle. 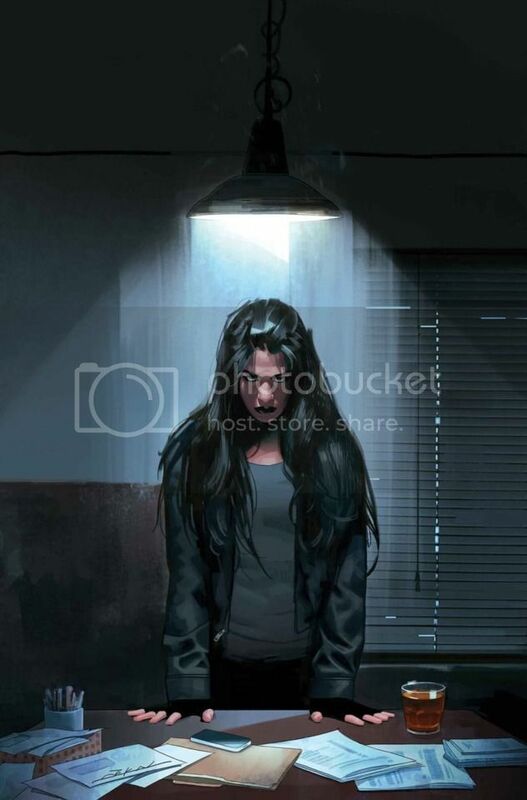 Jessica changed her mind about running away, and came out of hiding so that Killgrave could find her. The Purple Man approached her at her temporary headquarters, the abandoned Hauser's Bakery, and attempted to open up to her, claiming that he wanted to be different and that he needed her help to do it. Jessica's allies gunned him down, and in retaliation, the Purple Man caused all bystanders in the area to riot, giving him a chance to recover and escape. Jessica decided to play by Killgrave's terms, and agreed to listen to him. He lured Jessica to her blown-up office while taking control of Captain Marvel. Once there, Killgrave confessed his belief that he could be some kind of god. Jessica argued that he could use his powers to help the world instead of creating chaos. Because of this, Killgrave offered Jessica to do whatever she wanted in order to make the world better. Instead, Jessica confronted Killgrave for the abuse he forced her to endure and told him off. After admitting that Jessica was right, the Purple Man simply left her office claiming that he knew what he needed to do. While walking down the street, he suddely dropped dead. With her nemesis seemingly gone for good, Jessica was freed of one of the biggest burdens of her life. Characterization: Jessica has become a hard-nosed, but soft-hearted detective, hero and mother. Friends and Foes: Jessica is married to Luke Cage and though they have had their issues they remain in love and committed to their family. She has a daughter, Danielle Cage, that they both love dearly. She has many friends in the superhero community including Jessica Drew, Carol Danvers and Patsy Walker. Her greatest foe has been The Purple Man. We're keeping this LADIES' NIGHT rolling as we continue to add more females that inhabit the Spidey Verse! Motivation: Proving herself to the superhero community (and mostly herself) in the wake of her imprisonment by the Skrulls. Relationships: She's had a long, off and on relationship with Hawkeye, Clint Barton. Build Comments: Again, some of you might say, "Listen, punk! Bobbi is an Avenger and SHIELD agent! She's not in the Spider Verse!" This take on Bobbi factors in her current power set where she was almost killed by Superia and the only way to save her was having Nick Fury inject her with a prototype combination of the Super Soldier Serum and The Infinity Formula. So right now she is an immortal super soldier, but they don’t know what side effects there are. I think it’s a great for her, so that’s how she rolls on Earth-217. I haven’t had much of a chance to expand on her rivalry with Batwoman, but I will. I just have an idea swimming in my head that I need to catch, tag and release. Secret Origins: Barbara "Bobbi" Morse attended the Georgia Institute of Technology, specializing in biochemistry. Upon completion of her Ph.D., she was admitted onto the Project: Gladiator team under Dr. Wilma Calvin. She was also Agent 19 of SHIELD. The Story so Far: She traveled to the Savage Land with Dr. Paul Allen, with whom she was involved in a sham engagement on SHIELD orders due to (correct) suspicion that he was involved with AIM. In Florida, Allen was destroyed by Man-Thing, who was once Barbara's colleague, Dr. Theodore Sallis. With Ka-Zar, she traveled to New York and helped defeat Victorius, who had taken a sample of Super Soldier Serum from Sallis and Calvin's experiments. Barbara's penchant for taunting her opponents in battle earned her the codename of "Mockingbird". Morse was a freelance agent when she met Clint Barton, a.k.a Hawkeye, when he was temporarily serving as chief of security for Cross Technological Enterprises. During this time, they were kidnapped by Crossfire, who wanted to use hypnotic ultrasounds to force superheroes to kill each other. Hawkeye and Mockingbird defeated Crossfire, but Hawkeye suffered hearing damage due to the villain's ultrasound technology. Hawkeye and Mockingbird eventually eloped. When Hawkeye returned to active duty as an Avenger, The Vision, then Avengers chairman, appointed him to head a new branch of the team based on the West Coast. Hawkeye chose Bobbi as one of his team members, along with Iron Man, Wonder Man, and Tigra. Clint and Bobbi served as the motivating force behind the team. After several adventures, an incident with a time displaced Mockingbird led to she and Clint’s estrangement. Hearing that a Midwestern-based team was using the name "Great Lakes Avengers", Hawkeye took Mockingbird along with him to investigate. After determining that these "impostors" had no malicious intent, Clint and Bobbi took it upon themselves to train this neophyte crimefighting team. Bobbi, as a former Agent of SHIELD, was among those called in by Colonel Nick Fury to help him decommission old SHIELD outposts and technology after shutting the organization down in the wake of the Deltite Affair. This paved the way for the foundation of the second, U.N.-sponsored incarnation of SHIELD. After Operation Galactic Storm (during which Bobbi was part of the team of reservists who remained on Earth), the West Coast team and Vision encountered Ultron once again. This time he was accompanied by his latest "mate", Alkhema, whose brain patterns had been based on Mockingbird's. Alkhema, however, turned on Ultron, and the Avengers won the day. Clint, who had recently re-assumed his Goliath identity, managed to reconcile with his estranged wife at this time. When Mockingbird was captured by Satannish The Supreme, the AWC embarked upon what would be their last mission. The team battled the combined forces of Satannish and Mephisto. During their escape, Bobbi was killed by Mephisto. Shortly thereafter, the Vision disbanded the West Coast team. After death, Bobbi's soul had apparently become trapped in Mephisto's Realm. While there, she was occasionally able to help other heroes. She fought alongside fellow Avenger Hellcat in the Arena of Tainted Souls, and kept company with dead Great Lakes Avengers. After the climactic battle between the Skrulls and Earth's heroes during the Secret Invasion event, the individuals replaced by Skrull agents were revealed to be alive and well, including Bobbi. She was apparently one of the first people captured and replaced, with this occurring sometime between the start of her relationship with Clint and her apparent "death." 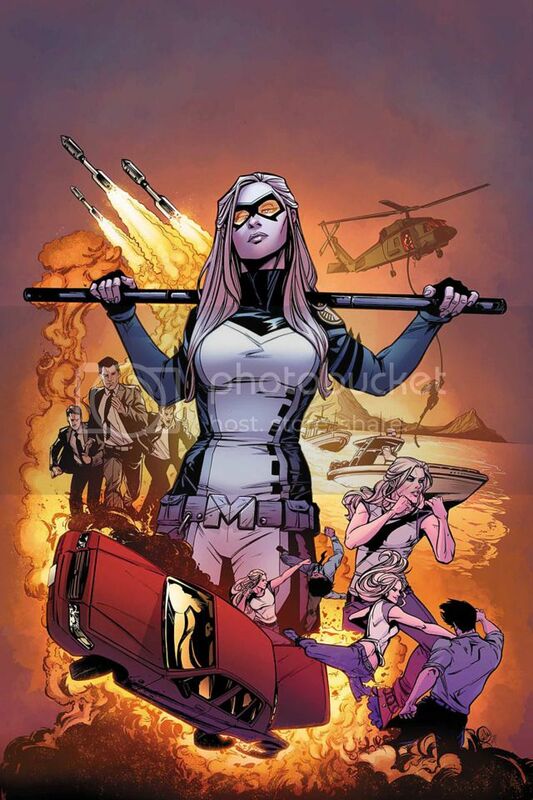 The returned Mockingbird then joined her estranged husband and his teammates in the New Avengers. Bobbie formed her private spy organization, the World Counterterrorism Agency, or WCA. She was joined on her first mission by her husband, Clint Barton, as Ronin. After Norman Osborn was replaced by Steve Rogers, the Avengers teams were reorganized and Bobbi joined Luke Cage's team. She and Clint separated after a particularly intense WCA mission involving a new Phantom Rider. During a confrontation with Superia she was grievously injured. To save her life Clint had Nick Fury inject her with a formula that was a functional combination of the Infinity Formula and the Super Soldier Serum. She worked with Peter Parker closely as the SHIELD liaison to Parker Industries until it was dissolved. They dated briefly but ended on good terms and remain close. Bobbi continues to work with SHIELD and The West Coast Avengers. Characterization: Bobbi is a feisty opponent and dedicated hero and SHIELD agent. Drove me nuts when they broke her and Clint up Dammit. Preach. Like I said, Marvel and DC hate happy couples. The Spider Verse keeps on expanding as we keep this LADIES' NIGHT going! Check out this CHIP OFF THE OLD BLOCK SPECIAL for Aisle 2! Big Shoes to Fill: May feels a lot of pressure to live up to father's legacy. Enemy: Pretty much all her dad's enemies, Doctor Octopus, Green Goblin, Sandman and many others. Power Loss: Sometimes the flu, a radiation drain or just his own mental state can cause him lose his powers. If he does, his stats change to STR 1, STA 2, AGL 2, DEX 2, and FGT 3. Relationships: She is close to her mother, Mary Jane Watson-Parker and her brother Benjy. She honors the memory of her deceased father, Peter Parker, the original Spider-Man. She is also becoming close to the Ben Parker of another Earth who has come to her Earth to be part of their family. Secret Identity: May "Mayday" Parker, daughter of Peter and Mary Jane Watson-Parker. Build Comments: I never read any of the MC2 stuff so my first real introduction to May “Mayday” Parker was in Spider -erse. In addition to the well-known Parker Luck, for a lot of the expys they should have the Parker Pluck, which May has in spades. You can pretty much guarantee that she’ll get thrown into Marvel Multiverse events for a good while until her brother takes over the mantle for her dimension since his potential played a significant role in the crossover event. Secret Origins/The Story so Far: May "Mayday" Parker is the daughter of Peter and Mary Jane Parker of Earth-504. Peter and Mary Jane named their daughter after his Aunt May. They were reunited with their baby girl by Kaine, who found the child living with Alison Mongraine (Sister of Mary Jane Parker), the con artist who had kidnapped the baby on instruction from the Green Goblin. After they were reunited, Peter lost a leg during the horrific final conflict with the Green Goblin. After the battle Peter was offered a bionic replacement from Mister Fantastic but, considering it a wake-up call, decided to retire and focus on being a husband and father. For years, they chose to keep their past from May and hoped that she wouldn't develop powers of her own. 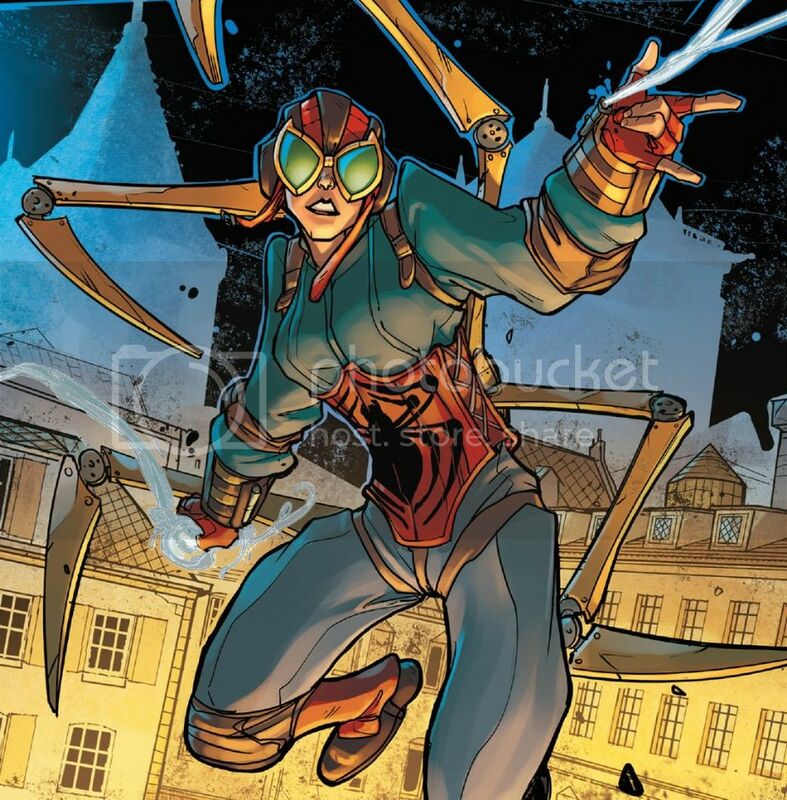 Despite her parents' hopes, May began developing versions of her father's spider-powers when she was 15. At the same time, Normie Osborn, grandson of the original Green Goblin, set out to restore the family name. May donned Ben Reilly's Spider-Man costume to stop him and soon took to crime-fighting, at first hindered, then helped, by her worried Real Parents. As part of the Great Hunt initiated by Morlun, his brother Daemos located May's family and Wes and immediately assaulted them, managing to badly wound May and damage Peter Parker's cybernetic leg. Peter, in an effort to save his daughter, collided with Daemos, knocking him clear. May managed to grab her brother, Benjy, and could only watch on in horror as her family members were cut down in front of her. Just then, two other Spider-Men opened a portal from another universe and beckoned May to join them. A tearful May then vowed vengeance on Daemos for the murder of her loved ones as she vanished. She later accompanies Spider-UK, Spider-Ham, and Old Man Spider-Man to recruit the Peter Parker and other Spider Totems of Earth-217, revealing herself to him to convince him of the gravity of their situation. Later, Benjy was revealed to be the Scion and was kidnapped by the Inheritors, 217 Peter promises May they'll get him back, but she angrily declares her father to be the true Spider-Man compared to the rest of them. When Uncle Ben tries to have a heart-to-heart with her, calling her out on the egotism of claiming her father is the only true Spider-Man and acting like she's the only one who lost loved ones, May attacks and berates him. Their fight is interrupted when a wall she cracked in a fit of rage crumbles and unleashes a horde of mutant spiders. The two set aside their disagreement and work together to contain the spiders, but May stubbornly refuses to let go of her desire for revenge against Daemos, stating that she hopes that somewhere an alternate version of herself exists who never had to suffer the loss of her loved ones. However, after witnessing the death of the Inheritors' Master Weaver, May realizes the cost of revenge and refuses to kill them, stating that she will seek justice rather than vengeance, with Spider-Ham commenting that, if her father was anything like him, he would be proud of his daughter. With the Inheritors defeated, May returned to her world with Uncle Ben, learning that her mother and Wes had survived the Inheritors' attack. As Ben chose to remain and be the grandfather he never had the chance to be, May decided to take on her father's costume and rename herself Spider-Woman. Characterization: May shares traits of both of her parents. Like her mother, she is a beautiful, charismatic, and a popular student in her high school, and she is intelligent and talented just like her father. She also inherited his love for in-fight bantering and his intolerance for injustice. Even without her spider powers, she is a very good athlete and excelled in her girls' baseball team until she quit, her resignation coming after the manifestation of her powers. On the one hand, May seems to have inherited the "Parker luck" in which her dual identity wreaks havoc in her private life. On the other hand, her superhero career, unlike her father's, begins with her successfully protecting her family. From the early part of her career onward, Spider-Girl has developed a reputation for avoiding unnecessary battles with anyone and reforming her former adversaries, like Normie Osborn and Raptor. 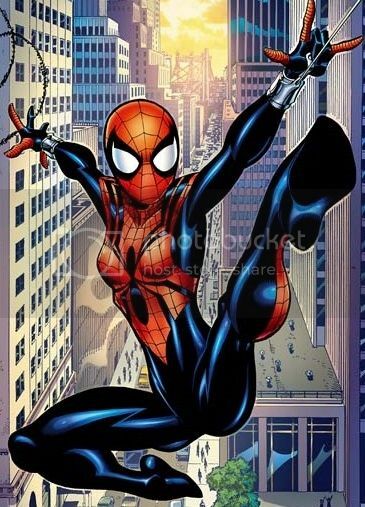 Spider-Girl quickly establishes herself in the superhero community and gets along with other superheroes easily, gaining reserve status in the Avengers and allies in the New Warriors and Fantastic Five. With Jessica Jones I'm still waiting to see how she reacts when she finds out that her daughter Danielle is in some future Marvel timelines going to become the new Captain America. Loving all of the Spidey builds Thorp. Quick question though. Are you house ruling Power Attack? I see where you're buying it multiple times for different attacks, but didn't see anything in your House Rule section about it. It makes sense, especially for "blaster" characters who can throw out a bigger blast, but shouldn't be able to punch like tank. Yes I am and yep, I forgot to put it on my House Rules post. I will rectify that shortly. You hit the nail on the head with my thinking. When I was building Batman again, it bothered me that with Power Attack, he could get a +11 with a Batarang. It really came in play when I started my fighting game builds, where there were some attacks I wanted them to be able Power Attack fully with but not others. So I came up with a house rule that made Power Attack like Improved Critical where it's a ranked effect. So far, I really like it. The builds are going to slow down again for a bit, though. We've got a ton of activities coming up, weekend trips, family vacation and whatnot so I'll get a few more in early next week but after that, the pickin's will be slim for a few weeks until things slow down again. I've really been groovin' too, but family duty calls. The Spider-Verse LADIES' NIGHT keeps going with this BLACK LIGHT SPECIAL for Aisle 2! Enemy: Most of Spider-Man's Rogues Gallery, Dr. Octopus in particular. Identity Crisis: Jessica sometimes struggles with being a clone of Peter Parker. Motivation: Living up to her genetic benefactor's legacy. Power Loss: Sometimes the flu, a radiation drain or just her own mental state can cause her lose his powers. If she does, her stats change to STR 1, STA 2, AGL 2, DEX 2, and FGT 4. Relationships: She has become close to Miles Morales and she has forged relationships with the cloned Spiders in the Spider Army. Build Comments: The Ultimate Universe Jessica Drew is a clone of Peter Parker that came about during their take on the Clone Saga. She was around for a quite a while and had a pretty significant history prior to the demise of the Ultimate Universe. She played a significant role in the Spider Verse event and it will be interesting to see if she’s still around in the restored Ultimate Universe. She’s certainly around in mine. Secret Origins: Jessica Drew is a genetically-engineered clone of Peter Parker whose chromosomes were manipulated to make her female. Created to act as an agent for the CIA (code name: Spider-Woman), she retains Peter's memories. The intent of her creators was to erase her memories and implant new ones, but Jessica escaped before the process could be carried out. Doctor Octopus reveals himself as the mastermind behind the experiments that created her. Jessica and Peter fight Doctor Octopus together, and eventually prevail. Peter surrenders to Nick Fury while Jessica opts to flee. At the storyline's close, Jessica decides to start a new life and embrace her given identity. She takes her leave of Peter after what she calls "the most awkward hug in history". The Story so Far: Later, Spider-Woman is seen doing recon on the Roxxon Corporation, investigating possible illegal genetic experimentation, when the corporation building is attacked. It is assumed that the person behind the attack is the "Ultimate Enemy". She is later attacked by the same creature that destroyed the building. Drew then attempts to infiltrate Roxxon, posing as an employee named "Dr. Julia Carpenter". On her first day, she is introduced to the Roxxon Brain Trust. Shortly afterward, they witness an attack on the Baxter Building and Roxxon suggests they move into an underground bunker. While waiting there, Misty Knight starts to ask her questions and figures out that she is not who she claims to be. The Roxxon Brain Trust then reveals that they suspect Roxxon in the attacks. Spider-Woman doesn't trust them and when they want to see her powers, she webs them up and attempts to flee. One of the Brain Trust members transforms into a brute of some sort and knocks her out before she can get away. Spider-Woman awakens to find herself bound on a table and meets the Brain Trust's leader, Doctor Octopus. It doesn't take long for Spider-Man to arrive and save her, just before Roxxon is attacked again. As the duo start rescuing civilians, they notice Doctor Octopus is also in danger. Although Spider-Woman wants to let him die, Spider-Man eventually manages to convince her to help save him. Rick Jones arrives with the Human Torch and they learn that heroes are gathering to take down Reed Richards. Spider-Woman and even Doctor Octopus join the group. During the attack in the Negative Zone, Spider-Woman meets the Ultimates for the first time, and assists Captain America himself. After the confrontation with Richards, Spider-Woman becomes an agent of S.H.I.E.L.D. at Carol Danvers's request. After Peter apparently dies fighting the Green Goblin, she confronts the new Spider-Man (Miles Morales). She later assists Iron Man and Hawkeye in fighting Electro. Eventually, Spider-Woman becomes frustrated about being in the Ultimates team. She is captured along with Captain Britain by the new S.H.I.E.L.D. director Marvin Flumm, but is later released and takes part in Captain America's swearing into the presidency. When Captain America went to join the states once more, Spider-Woman joined the new President and was part of the ground forces. During the "United We Stand" storyline, Spider-Woman is reluctantly teamed with Miles during S.H.I.E.L.D. 's battle with the terrorist group HYDRA. After they are separated in the battle, she finds him and returns him to New York. Initially, she is not forthcoming when Miles asks why she cares so much about him. But after Miles quits being Spider-Man following personal tragedy, Jessica reveals to Miles that she is Peter's clone. She explains that although she has Parker's memories, she is not Spider-Man, but feels that Miles should be. This convinces him to resume the Spider-Man identity. Later, the two team up with Cloak & Dagger and Bombshell to fight Roxxon's Brain Trust and confront Philip R. Roxxon. Along with Kitty Pryde, the group becomes the New Ultimates. 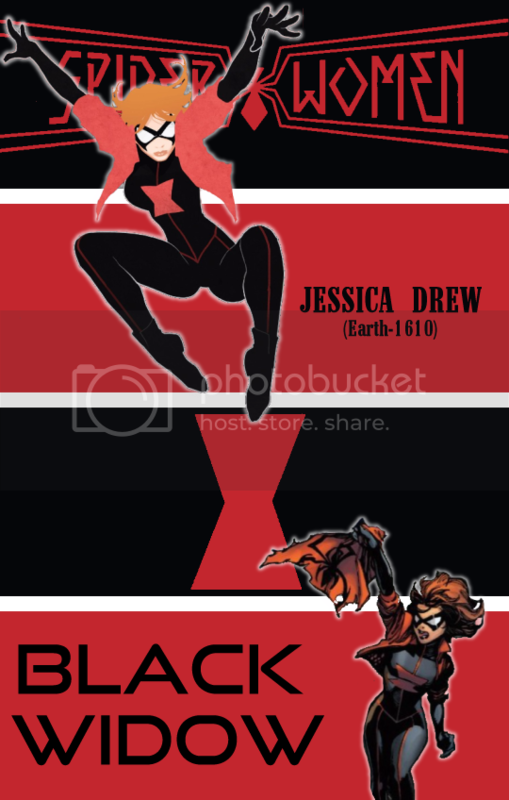 Jessica changes her superhero alias to "Black Widow”. When Jessica was accompanying Miles visiting his mother's grave, they were suddenly attacked by Verna of the Inheritors. They were helped by the Superior Spider-Army, who brought them to their safe zone. After Daemos attacked their base when a second Spider-Army appeared to recruit the other one, the Spider-Men began to break off in groups. When Daemos returned shortly after being killed by both Spider-Armies, the Scarlet Spider deduced the Inheritors perpetuated their lives by using cloned bodies, and used the Spider-Army's teleporter to track down the dimension Daemos' new body came from to go investigate. Jessica and Ben Reilly followed the Scarlet Spider into the portal and to an Earth where they discovered that it was ruled by Jennix. At the cost of Ben Reilly's life, Black Widow and the Scarlet Spider managed to neutralize Jennix's cloning facility, thus allowing the Inheritors to die once and for all. Reilly's life angered the Scarlet Spider to the point his The Other persona took over and went to the Inheritor's reality for revenge, leaving Jessica behind without a teleporter. 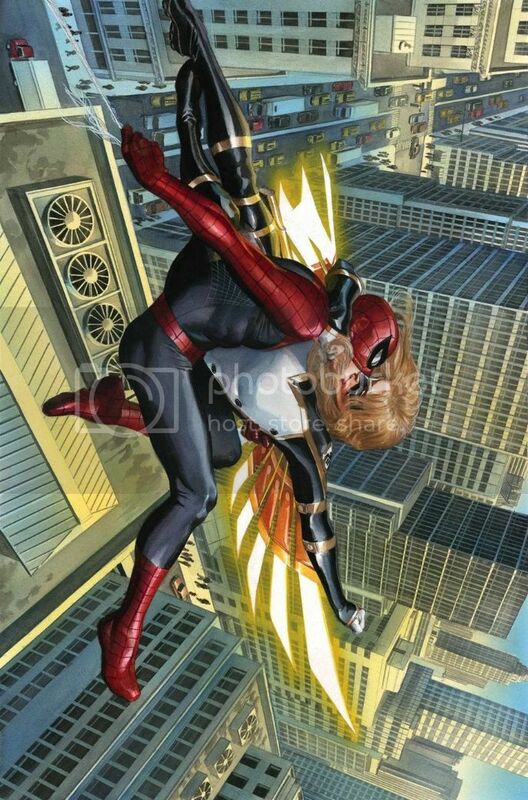 Jessica later managed to join the final fight between the Spider-Army and the Inheritors, and found Kaine's torn costume in the battle. Characterization: Jessica is the youngest clone of the Peter Parker of Earth-T302. She not only inherited his powers but his heroic nature and willingness to help others. Last edited by Thorpocalypse on Thu Jul 12, 2018 2:10 am, edited 1 time in total. We've got more Spiders to stock as another LADIES' NIGHT rolls on! Enemy: The Six Men of Sinestry and The Inheritors. Motivation: Being free to do what she wants and proving women are the equal of men. Relationships: She is close to her mother, despite their differences. She has gained the respect of the other Spiders, despite not technically being a Spider totem herself. Secret Identity: Lady May Reilly. Build Comments: Lady Spider quickly became one of my favorite Web Warriors with her look and pluck. I could totally see her being played like Amy Adams played Amelia Earhardt in the second Night at the Museum movie. Secret Origins/The Story so Far: May Reilly's father kept numerous animals in his study, one of them was a spider. One day, May opened the spider's cage so it could get comfort, as she believed it to be upset for its captivity. May then tried to pet the spider, and as soon as her hand got near, the spider bit her. According to May, the spider taught her an important lesson, not to let anyone cage you. After her father died, May used spare parts of his garage to create a suit with four mechanical arms which enabled her to climb walls. She also created mechanical web-shooters. May lived her life, but was eventually recruited by Spider-UK and the Spider-Army to fight against Morlun and his family. May Reilly fought bravely and even gained a few new friendships. After Morlun was defeated, May joined a number of former Spider-Army members in becoming the guardians of the great Web, also known as the Web Warriors. Wow, almost a month without stocking the shelves...that just will not do! Now that the travels are mostly over for the management staff, it's time to get back to work! We don't have a theme at the moment but we have several new items in the stockroom that are ready for the shelves so check out this BLACK LIGHT SPECIAL as we start stocking again! Build Comments: With the hype around the Aquaman movie, I figured I would get back to whipping up some members of his universe prior to the movie. So here's Black Manta. 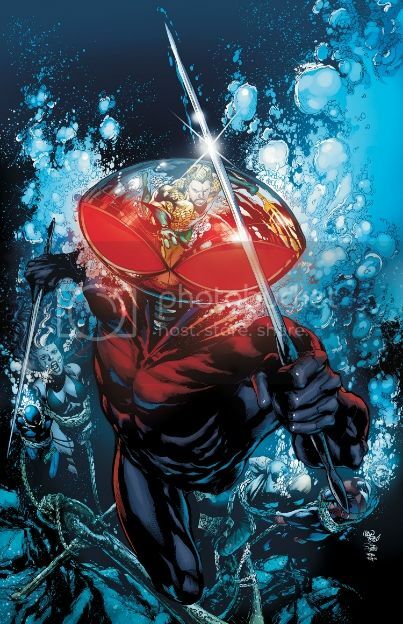 I used to hate Black Manta for a long time for him killing Aquababy. I still hate that part of his history, but overall as a villain, I have come to like him a lot. Especially in the New 52 where he and Aquaman both hate each other for their involvement in the deaths of each other’s fathers. That gives a real gravity to their rivalry. I wanted my Manta to be able hang with Aquaman on a regular basis so he's pretty capable underwater, just a shade below my Arthur. Characterization: Black Manta is one of the most ruthless and dangerous villains on the planet, being single minded of focus and a strong combatant, both on land and see. We've got more new items from out Gotham location as we add more new items for Aisle 1! Power Loss: The Talons' regenerative abilities are derived from a special electrum serum. 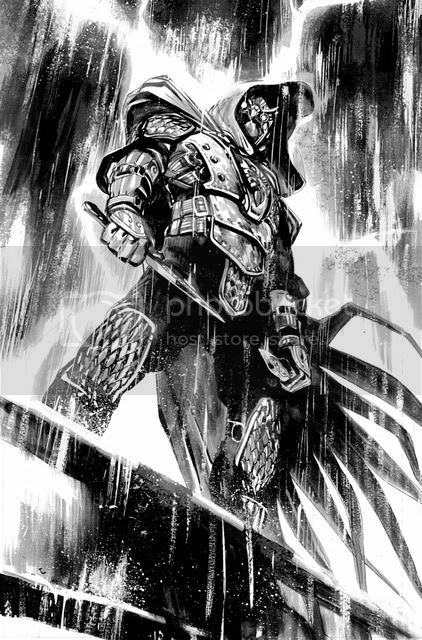 If denied of it when incapacitated, the Talon's regenerative powers cease to function. Responsibility: To serve the Court of Owls. Vulnerable: Talons are vulnerable to cold effects. They are Impaired in all checks against cold based effects and they take an extra degree of failure against. It also halts their regenerative abilities. Build Comments: I hadn’t really heard of much of Scott Snyder’s stuff until he took over Batman years back, but OMG, did he turn in an epic run on the book and has become one of DC’s biggest writing stars along the way. His arc with the Court of Owls was his magnum opus IMHO. You can Wiki (or do yourself a favor and pick up the books) for the info, but to sum up, the Court of Owls have been controlling Gotham from behind the scenes for over a hundred years and up until the time of the arc they’ve somehow stayed off Batman’s radar. But that is no longer the case since they decided Bruce Wayne had to die and they sent their master assassin, the Talon (William Cobb), to kill him. Obviously, that wasn’t going to work because he's the frickin' Batman and so it became full scale war with the Court unleashing 40 of their Talon assassins on the city and the Bat family between them and the murders of several prominent Gotham citizens, including Bruce, Lucius Fox, Jim Gordon and interestingly enough, Mr. Freeze. It’s all chronicled in the Night of the Owls crossover event that I cannot recommend enough. Since then, the Talons and the Court have been lurking around the DCU, with one of their Talons even getting his own book. So it looks like they're here to stay. Here are the Talons for my setting. These guys are street level nightmares, especially since I wouldn’t consider using the minion rule with them unless there are a ton of them attacking one person as that would eliminate their regeneration. Basically, all the Talons can regenerate from wounds almost instantly and if they are not frozen, they can come back from death pretty quickly, too. I probably undersold their Immortality, but I figure once a day is good enough for now. And I originally had them at 10 ranks of Regen but that was too much considering some of them have gotten taken out pretty quickly at times. They are masters in close combat and with throwing blades, so you combine that with their regeneration and they are really tough outs for the Bat family. I’m working on some of the “name” Talons and they should be up soon. But here are some elites to fill that role for the time being. Build Comments: Some Elite Talons who would lead the groups of regular Talons. It could also be used for some of the name Talons that didn’t make it through the Night of Owls like Ephraim Newhouse. It's time for a J-Mart Favorite Item as we pay tribute to one of our best selling items that is getting ready for its last ride! Disability: Sharknadoes cannot speak languages and have no hands. 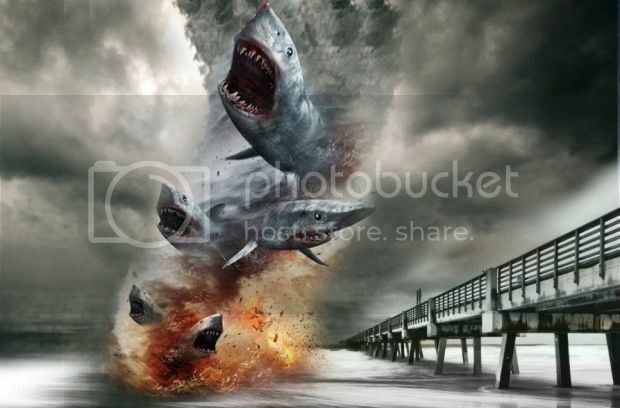 Plot Device: It's a tornado filled with sharks. It is THE plot device. Build Comments: The legendary Sharknado makes an appearance at J-Mart one last time. The epic (well, that's a BIT of hyperbole) made for TV camp film series is finally ending this weekend with Sharknado 6: It's About Time this Sunday, August 19 on SyFy. I built this a while ago but with the final film coming out, it was time to post it as an homage to one of the biggest success stories of bad movie-making in history. The original Sharknado was SO unabashedly cheesy, it became a classic of bad movies. Which of course led to a sequel, which of course led it becoming a trilogy and then it just kept going. It became the "it" thing to be in for all the C and D listers, who all wanted to be eaten by sharks from the Sharknado. I mean, Chris Jericho, Wayne Newton, The Hoff, Carrot Top, Gary Busey, Bo Derek, Kelly Osborne, Lou Ferrigno, Biz Markie and even more popular celebrities like Matt Lauer (before he got MeToo=ed), Kelly Ripa and Michael Strahan, even George R.R. Martin have made appearances. It's been an amazing, poor CGI, terribly acted ride and I am actually kind of sad it's going to be over. I borrowed a lot from Prodigy Duck’s earlier build of it and I think it came out well. I haven’t taken the time to build many animals yet, so I guess if you want to use it, you can use the sharks in the main books or Jab’s versions for the minions. It's time to add to our JOB SQUAD LINE! Check out this new item for Aisle 2! Enemy: He has a rivalry with Daredevil and The Black Widow. Hatred: He hates the US and wants to help bring down the "American Empire”. 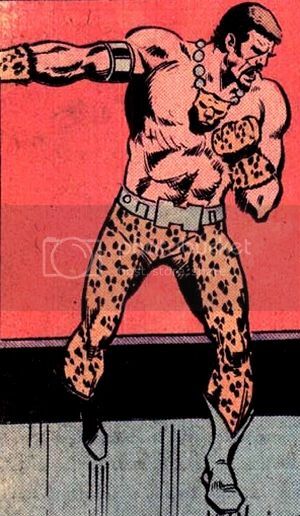 Build Comments: You know I can’t get enough jobbers so here is this dude, El Jaguar, who received the highest of Marvel Jobber honors: he was offed by The Scourge and NOT resurrected. I mean, Turner D. Century comes back, but this guy, who actually beat Black Widow one on one in his first appearance stays dead? Now that is jobbery. But fear not, true believers, El Jaguar is still alive and getting beat up on a regular basis in the Thorpocaverse! The Story so Far: El Jaguar was the leader of an elite commando unit of HYDRA, alternatively known as Bravos Commandos and Commando Division. One of those commandos was famous assassin Horst Eisele. HYDRA's enemy organization S.H.I.E.L.D. publicly contacted with district attorney Foggy Nelson to join its board of directors. HYDRA marked Nelson as a target, and ordered Jaguar to murder him. Jaguar and his commandos attacked a New Year's Eve party Nelson was invited to. Nelson's partner Matthew Murdock also was there, along with his then girlfriend Natasha Romanoff - who were also known as costumed superheroes Daredevil (Matt Murdock) and the Black Widow (Natasha Romanoff). Both of them changed to their secret identities and fought the terrorists. El Jaguar was more than a match for any of them: He defeated the Black Widow and fought Daredevil to a stalemate. However, the tables turned due to the opportune arrival of SHIELD agents led by Nick Fury. El Jaguar ordered a complete retreat, and went to explain his failure to his leader. Jaguar then met with HYDRA agent Blackwing in a warehouse near the Shea Stadium. Both were unaware of Daredevil and the Black Widow tracking Blackwing. The Black Widow, still humiliated for her previous defeat, fought El Jaguar while Daredevil battled Blackwing. El Jaguar was nevertheless too strong for the Widow to defeat. In a last-ditch effort, the Widow prepared her widow's bite in killing position, but she only managed to knock El Jaguar down! However, Blackwing defeated Daredevil and, later, the Widow. Another HYDRA agent, Man-Killer, took unconscious Jaguar to the Supreme Hydra in a subterranean base under Shea Stadium. El Jaguar would not recover his consciousness for a while. When he awoke, the heroes had recovered and were launching a counter-attack. SHIELD had also found them and launched their own commandos. Jaguar tried to fight SHIELD agent Dum Dum Dugan, but was defeated by being slammed to a wall. Although the Supreme Hydra and Blackwing managed to escape, Jaguar and the other Hydra agents were arrested by SHIELD. He somehow escaped and years later, Jaguar remains at large. It is believed he has shifted allegiances to other criminal organizations from time to time in addition to doing freelance work. Characterization: El Jaguar is a strong melee fighter. Friends and Foes: El Jaguar longs to gain revenge against Daredevil and Black Widow for his past defeat.